Folk on Hoy are getting together on Friday 20 March to remember Hoy’s wartime history and celebrate the continuing use of one of the island’s wartime buildings, the YM, which has just been extended to facilitate increased community use. The evening gets underway at 6pm with an exhibition drawing together outcomes of the Island of Hoy Development Trust Legacies of Conflict: Hoy & Walls Wartime Heritage Project and local community archives and reminiscences. Funded by ScotGrad Placement Scheme, Orkney Islands Council’s Community Development Fund and the Heritage Lottery Fund’s Sharing Heritage Grant Scheme, the 12 month project looked at ways in which the unique wartime legacy of the island could be used to enhance the community, encourage tourism and act as an educational resource. 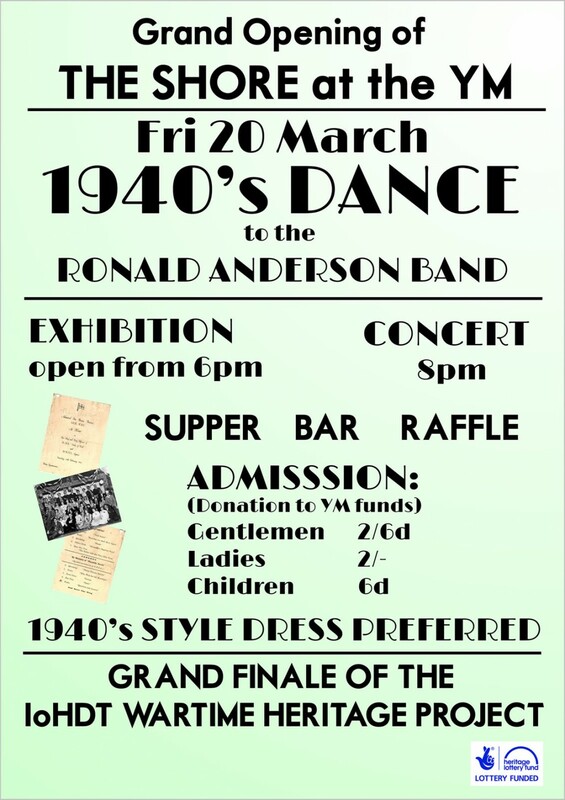 A wartime-style concert begins at 8pm, followed by supper, raffles and a dance to the Ronald Anderson Dance Band. This part of the evening throws the spotlight on the new bar and social area, named ‘The Shore’, a fantastic addition to the original building. Funded jointly by LEADER and the Big Lottery Fund, this is an airy and inviting space with fantastic views across Longhope Bay. Admission to the event is by means of a donation to YM funds, with the wartime dance prices of men 2/6d, ladies 2/- and children 6d suggested. 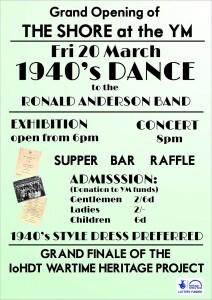 Everyone is encouraged to come in 1940s style dress – military or civilian – and the evening is sure to go with a swing.